How Important Are Flood Protection Systems? 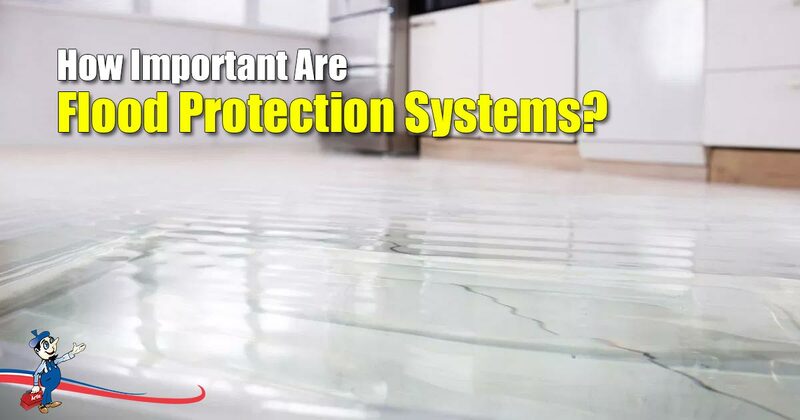 Flood protection systems may not seem as important as fire alarms or burglar systems in terms of safety and protection, however, this sort of system can prevent severe damage to and within your home. Although a flood protection system’s purpose cannot be seen each passing day, they offer the peace-of-mind you need that your home is not going to suffer water induced structural damage. Structural damage can be costly and is something you want to avoid. What is a Flood Protection System? Simply put, this is a system that is used to monitor and detect moisture and water in a designated area in your home. The idea is that the system will be able to detect a potential flooding hazard and alert the homeowner before disaster strikes. Some systems even have remote shutoff capability. How Much Water Will Trigger the System? The source of flooding can be burst water mains,blocked or damaged piping, damaged water valves as well as natural events like heavy/prolonged rainfall. However, protection from floods is not only for huge amounts of water, which is what comes to mind when one talks about flooding. Flood protection systems are designed to detect changes in moisture, like drips and leaks in your plumbing, which could lead to more serious problems. Dripping and leaks that go unnoticed can cause mold, which poses a serious health hazard for your family, or grow into a flooding hazard, which then results in serious damage to your home. If the sensor is triggered through excessive moisture or leaks and drips, an alarm will sound ensuring that the homeowner is alerted to potential flooding. Flood protection systems are beneficial for early detection.As an added bonus they can also save you thousands of dollars in heightened water costs from slow leaks. When a system is set up and installed by industry professionals offering plumbing services such as Art Plumbing, AC & Electric it is unobtrusive and will require minimal effort from you while your home is being protected,eliminating one more thing from your worry list. The system your home requires is based on the structural conditions of your home as well as where you live, how you live, and who lives with you. The best option will be the system that satisfies both your family and home requirements. For example, flood protection products have become sophisticated in their offerings as they develop more and more solutions to home flooding. Systems such as PipeBurst Pro assists you with more than just sensors and alerts. This technology allows for you to monitor and control your water from anywhere, while receiving remote notifications via SMS, E-mail and an automated call when you have an internet connection. There are solutions for both residential and commercial premises which would differ in size and capabilities and the extent of protection that is required. Various systems offer more detailed information on leaks such as exactly where the leak is occurring. Depending on the extent of information you would like to receive from your system, the sophistication of your system will differ. Products such as PipeBurst Pro allows you to monitor your water consumption whenever required. If this is an added service you are looking at having access to then there is a solution available. You may not require as much accessibility as the next house, so having options that fit your budget are available too. With PipeBurst Pro you are able to control your system from anywhere in the world. This may be beneficial to the lifestyle you and your family lead. This is a case of “prevention is better than cure”. Instead of risking the chances of flooding and leaks happening in your home, invest in a flood protection system suitable for your needs. At the end of the day, should any cases of potential flooding occur, you’ll be grateful you had the foresight to protect your home and protect your pocket. Are Commercial Drain Cleaning Products Bad For Pipes? How Do You Know If Your Attic Insulation Needs Replacing? Our dispatch center will contact you during regular business hour to confirm your appointment. Please note, the date and time you select is subject to availability and confirmation. Please provide the following information and one of our Commercial Services Representatives will contact you shortly.